Learn authentic and delicious recipes with this beautifully illustrated Filipino cookbook. This delightful collection of 85 tried and tested recipes from the Philippines showcases the full range of authentic dishes from the country. Each region has its own distinct food culture, and this book relates the secrets and soul of dishes that create the cultural mosaic that is the Philippines. 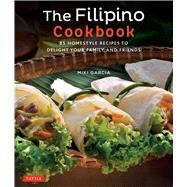 The Filipino Cookbook features easy, step-by-step instructions that Filipinos and non-Filipinos alike will enjoy. Learn to make the famous vegetable dishes of the Tagalog Peninsula to the seafood and noodles of the Visayan Islands and the spicy and colorful curries of Mindanao. Learn to make a perfect Pinakbet (Sauteed Vegetables with Shrimp Paste) or a delicious Halo-Halo (Mixed Fruits Dessert). Regale your friends with a wonderfully easy Paella (Rice and Seafood Medley) and Morcon (Stuffed Beef Roll) or an amazing bowl of Pininyahang Manok (Chicken with Pineapple). Utilizing readily available ingredients, The Filipino Cookbook allows anyone to create authentic Filipino food at home, whether you are one of the 4 million Filipino-Americans living in the United States or simply interested in trying something new. Miki Garcia is a journalist by training and a food aficionado by vocation. She obtained a Master's degree in journalism in England and is the author of two books: All About Ireland and How To Get Involved with International Organizations. She is an expert on Kapampangan culture and history and, though she has lived and traveled in nearly 100 countries, her greatest love is for the melting-pot food of the Philippines, where she lived for a year. She resides in San Francisco, California. Luca Invernizzi Tettoni was a world-renowned photographer who lived and worked in Asia for 40 years. He specialized in books on Asian culture including Tropical Asian Style, Balinese Gardens, Thai Style, The Tropical Spa and Contemporary Thai.